Battle rages through the halls of Subterra Bravo as unearthly creatures and human military fight over control of the underground facility. Amid the turmoil, a few desperate prisoners have managed to escape this hellish place. You were not so lucky. Subterra Bravo is now locked down, its exits sealed—and with them, perhaps your fate. Your only hope is to descend back into the bowels of this nightmare facility in search of another way out. But waiting within its unexplored depths are new dangers and even more deadly denizens, ready to put a grisly end to your bid to escape. Can you and your fellow survivors overcome your fears and the horrors that stand in your way, or will you fall prey to the frenzied monsters that hunt you? 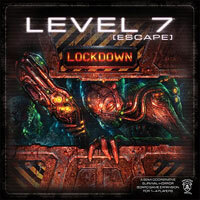 LEVEL 7 [ESCAPE]: Lockdown is a death-defying expansion for LEVEL 7 [ESCAPE] that adds new enemies, room tiles, and rules along with five new scenarios that will put your will to survive to the ultimate test. Add a Review for "Level 7 [escape]: Lockdown"